Crawling is a huge milestone. After months of relying on you (and other responsible adults) for transportation, your baby can now get from one place to another all on their own. They’ll feel mighty proud of their new achievement and will likely want to do it as often as possible. The whole world — or the living room, at least — is now theirs for the exploring. Here’s what you need to know about your new and on-the-move crawler. If your tot isn’t crawling, it’s unlikely to be a cause for concern. In fact, some babies never crawl. “Most babies start crawling between 7 and 10 months of age, with 9 months being an average time to start seeing crawling behavior,” explains Dr. Danelle Fisher, chair of pediatrics at Providence Saint John’s Health Center in Santa Monica, California. But some babies skip crawling and go straight to pulling up to stand, then walking. If your baby skips crawling but goes on to acquire other milestones, there’s no reason to worry. Most babies’ motor development progresses from rolling in both directions (front to back and back to front) to sitting up and then to crawling, explains Fisher. Some babies adopt the army crawl or belly crawl, in which they crawl on their bellies with their arms doing the bulk of the work, while others rock back and forth on their hands and knees and then eventually move forward. Other crawling styles are the crab crawl (moving with one best knee while the other remains extended, either forward or sideways) and the wind-up (moving backward before crawling forward). One common alternative to crawling is scooting (dragging the bottom across the floor). A crawling style that looks a little unusual is rarely anything to worry about, but if your baby tends to drag one side of their body, ask your pediatrician’s advice to be on the safe side. Ideally, your house should be baby-proofed before your little one actually starts crawling. (This saves you running around the house frantically unplugging things and eliminating death traps.) The best way to ensure you don’t miss any hazards is to get down on your hands and knees in each room. Fit child-guard latches on every drawer and cabinet your baby can reach. If you don’t have carpet, purchase nonslip rugs or colorful floor mats to give your baby’s little knees a break from the hard surfaces. If you have wood floors, deal with any uncovered nails or loose splinters that could hurt your baby. Place all fragile or sharp objects up high, well out of your baby’s reach. Store all chemicals on a high shelf or cabinet. Pad all sharp corners and edges of furniture, such as coffee tables and kitchen units. Remove or secure any large objects your baby could pull over. Eliminate all choking hazards. Check to see if small items fit into the cardboard tube of a toilet paper roll. If they do, they pose a potential choking risk. Block off rooms you don’t want your baby to have access to, such as the kitchen, bathroom, garage, gym, crafts room, terrace, laundry room or an older sibling’s bedroom. Roll up blind cords (or replace with cordless blinds). Even a thorough baby-proofing session can miss something, so keep a close eye on your crawling kid at all times. Crawling should be a fun time for you and your baby — not something that causes stress. 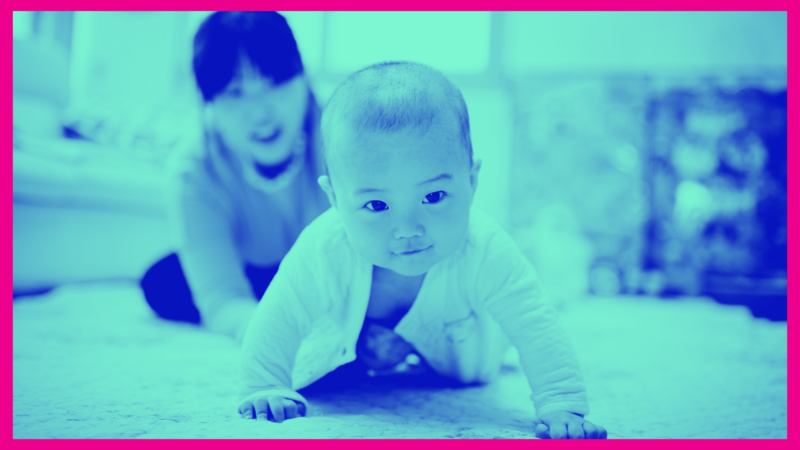 You can help prepare for crawling by giving your little one lots of supervised tummy time. This encourages them to lift their head up to look around, which in turn strengthens their neck, shoulders, arms and trunk. But remember: Babies do things at their own pace, and there’s no rushing a major milestone. So if crawling isn’t quite happening yet, just sit back and enjoy those final weeks of being able to leave your book and glasses sitting on the floor, OK?